Peter Rae, Biggar bonfire entertainments organiser and DJ for the Dancing, recalls the history of Biggar's Hogmanay celebrations. 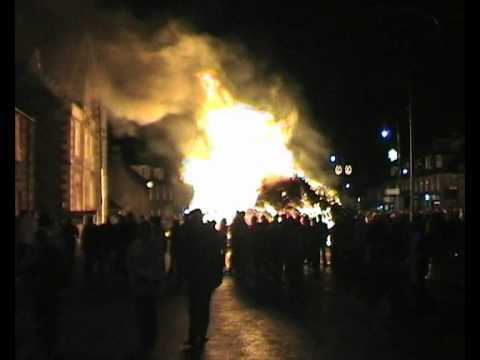 The Hogmanay Bonfire in the Borders town of Biggar (pop 2000), dates back to the pagan times when fire was worshipped and believed to ward of evil spirits for the New Year. It has continued at Biggar for hundreds of years and, as far as we are aware, there is no other town in the world that celebrates the coming of the New Year like Biggar. Even during the wars the tradition was kept alive by a group who burned a candle in a tin at the bonfire site, so as not to attract enemy bombers. Dancing and music was introduced several years ago and has proved most successful (no use having a big fire wi' nowt tae dae!). Some have tried to stop it. On two occasions in the early 40s, after complaints from disgruntled locals, a compromise was reached, to have a small fire. This was duly erected, but an hour before it was supposed to be lit, the local stalwarts brought around cart after cart of coal and wood and piled up making it the best fire in years. It burned for five days. No further complaints were made until the early Nineties when an incomer who had bought a house near the site complained to the authorities about its size. The Chief of the Fire Brigade and the police called a meeting with the organisers, declaring to them that "no way was that huge pile of wood being lit on Biggar High Street". A quick phone call to the right person soon sorted that out and a compromise was reached. It was allowed to go on but the fire brigade had to hose it down at half past midnight. This was agreed. At the given time the Fire Brigade began to hose it down, much to everyone's annoyance. Once it was hosed out they went back to base. I happened to comment what a pity they had wasted the night for everyone. "Dinna worry was the comment we have thirty gallons o' diesel round the back. It's going on in 10 minutes." So our tradition was kept going once again after all we kept to the agreement to put it out, they did not say we could not light it again! (in the welcoming speech the incomer was told in no uncertain terms that if he was not happy with our traditions, he better flit back to where he came from). So once again Biggar will be the place to be on Hogmanay. As the saying goes: "London and Edinburgh are big but Biggar's Biggar." Live Biggar Bonfire Web Cam can be found at this address from 9pm this evening till 2am.